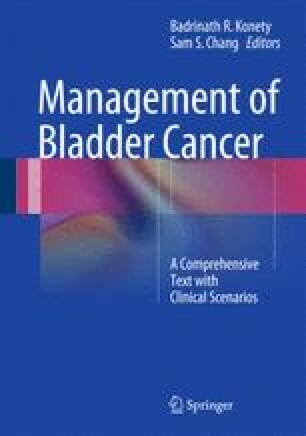 Urothelial cell cancer of the bladder is a multifactorial disease with well-established links to environmental factors and a clear demonstration of a genetic component in its development. Despite a twofold increase in incidence in first-degree relatives, a mode of inheritance, genetic site specificity, or an ethnic predilection has yet to be discovered. Specific chromosomal deletions, gene mutations, genetic pathways, epigenetic changes, and genetic susceptibility loci have been correlated with the development and staging of urothelial cell cancer. Two distinct clinical and molecular pathways to the development of bladder cancer have emerged, namely the pathway to non-invasive stage Ta disease and the CIS pathway that leads to muscle invasive disease. In this chapter we will discuss these two pathways in detail, along with the evolving approach to using genetics and molecular biology for predicting development of bladder cancer, effect on stage and grade, as well as prognosis.